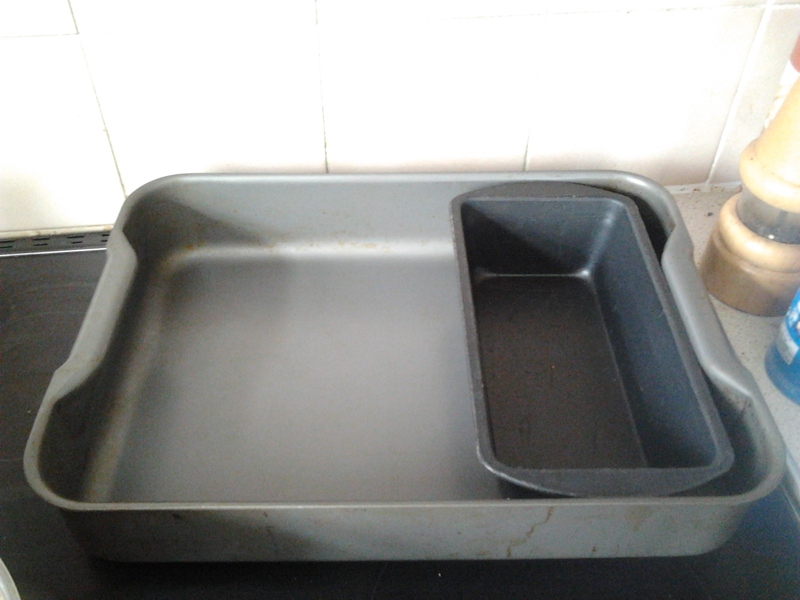 Remember the mantra: baking is not always quick, but it is always easy (see fatless sponge for the exception). It’s certainly true for this recipe which takes about 15 minutes to assemble and then 20 minutes in the oven. 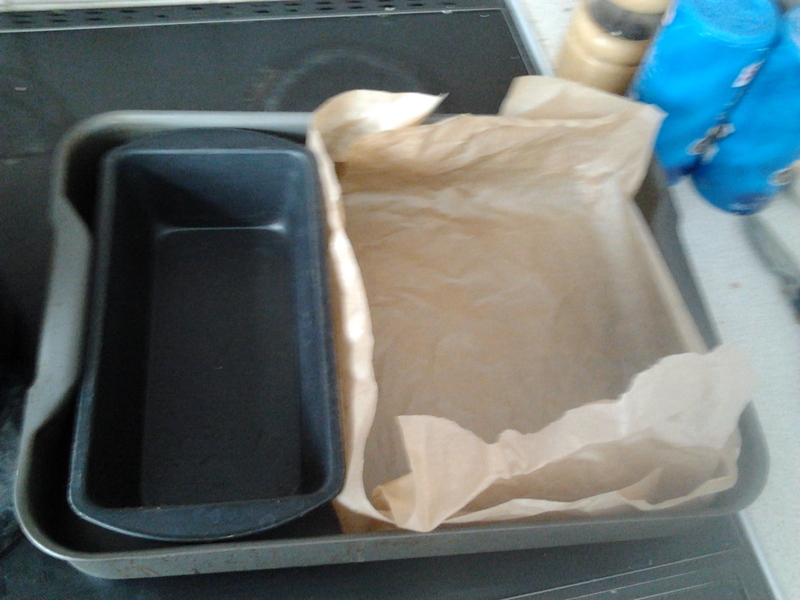 We’ve already established that I don’t own a 20 x 20cm brownie tin, so I improvised with a roasting tin, blocked at one end with a loaf tin. Tricky to line, but not entirely beyond my capabilities. 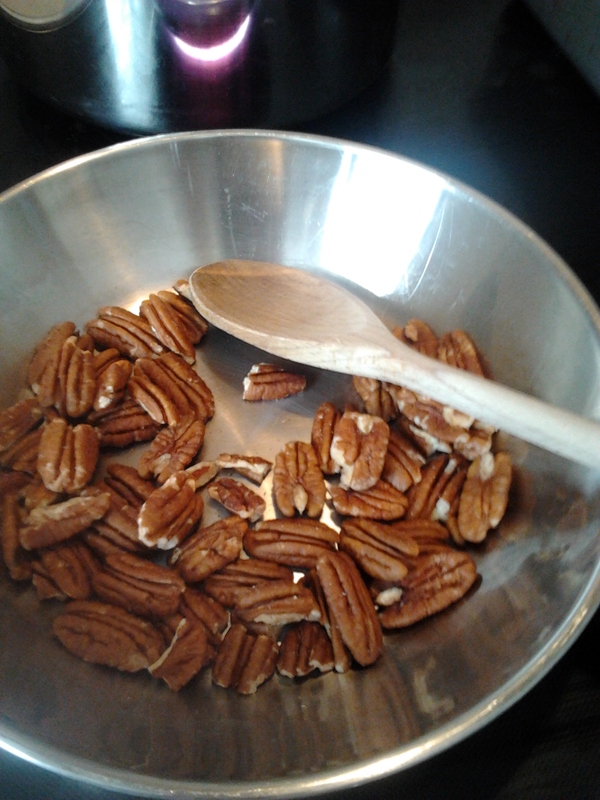 First, toast some pecans. Pecans is a word I wish we pronounced the American way. 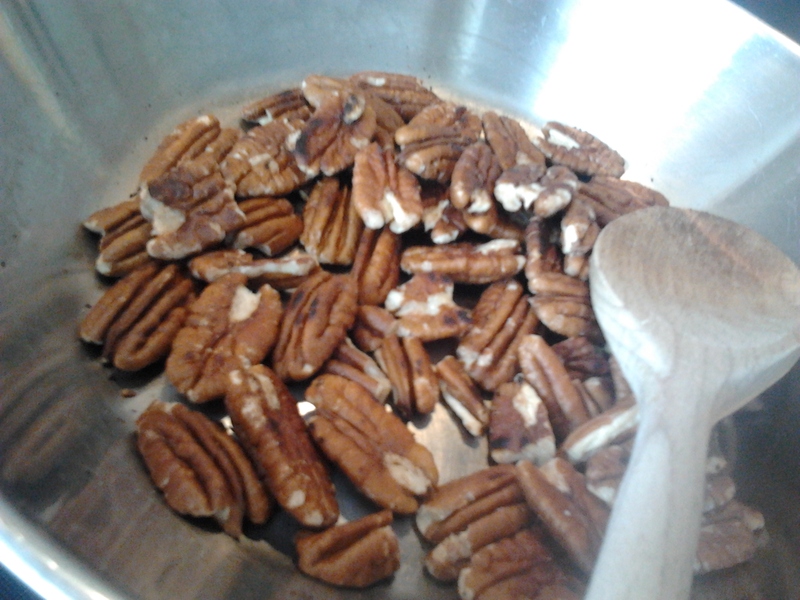 You need to toast the pecans until you can smell the pecanny flavour, then stop before they burn! You can see that the pecans don’t look that different before and afterwards. But they smell great! Then chop them chunkily. Melt butter and sugar in a large pan (these are not low-calorie granola bars!) then add pecans, pumpkin seeds, oats, cranberries (or other dried fruit) and maple syrup. It’s really easy to forget the maple syrup because the rest of the ingredients you’re adding are dry ingredients. As you can probably guess, I forgot the syrup, but I drizzled it over the cooked, warm bars and they absorbed it nicely. Crisis averted. When I was looking on Tesco online for maple syrup, it was quite expensive. But the Tate & Lyle one was relatively cheap. When it arrived, I realised why. It’s maple flavoured golden syrup. Cheeky. It seemed to do the trick anyway. You then mix it all together and press it down hard into the tin using the back of a spoon. 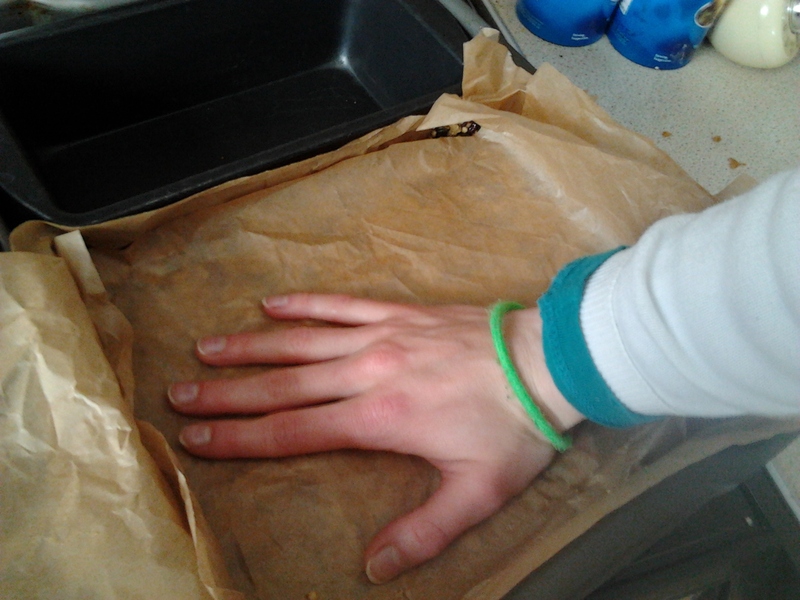 I went a step further and put down some more greaseproof paper before pressing down with my hands. Lorraine says it takes 30 minutes at 180’C, so in my fan oven it took 20 minutes at about 160’C. It was a bit tricky to get off the paper, but easier once cut into bars. 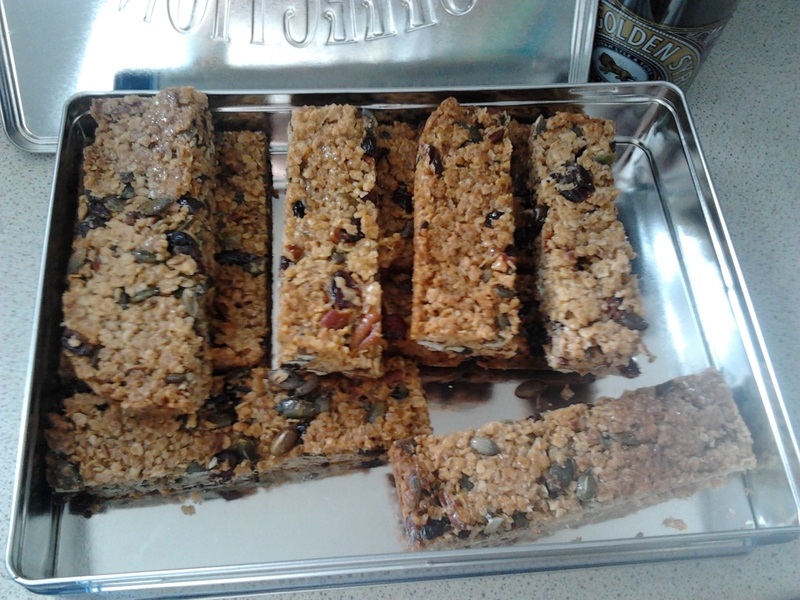 Lorraine says it makes 8 bars, but I made it into 12 and they are still huge. And yes, you eagle-eyed readers, that is the offending bottle of maple flavoured syrup lurking in the background. Lorraine helpfully points out that these are vegetarian (unless of course you substitute pork scratchings for the cranberries). 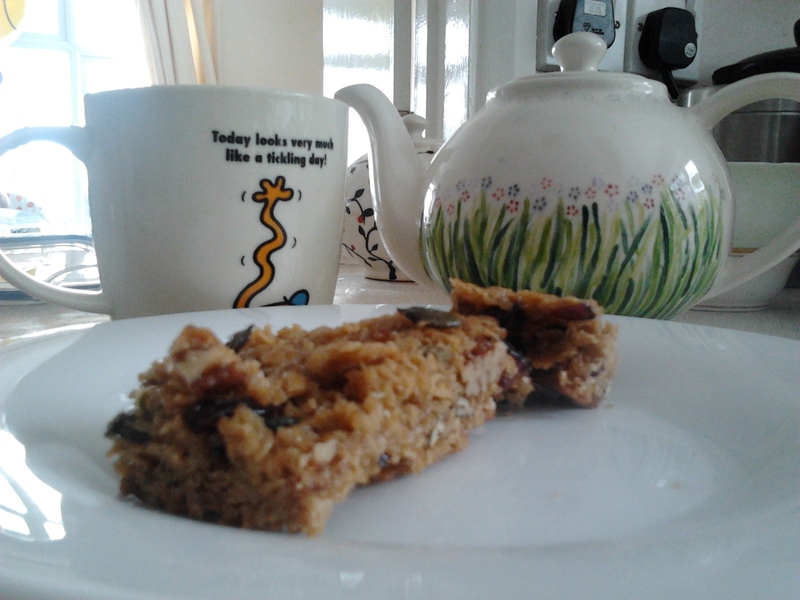 They are essentially a very tasty pecanny flapjack and perfect with a cup of tea. I’d love to send you one, but I don’t know how well it would travel. I’ll eat one for you! And what a lovely teapot it is too.